CHANGEdesk Mini is a fast, affordable, effective adjustable height computer riser. Designed for both laptops and desktops, CHANGEdesk Mini lets you quickly move from sitting to standing throughout the day (it takes < 3 seconds!). The sturdy design collapses to just 3” thick and only weighs 21lbs - making it a fast, portable and effective adjustable height computer riser. THE PERFECT LAPTOP STANDING DESK: The 27.5x19.5” top panel offers plenty of room to hold your laptop and work essentials. CHANGEdesk Mini collapses almost flat - holding laptops just 3” above your desk! This low height allows for comfortable typing that's almost identical to typing directly on your desk. Four height settings help ensure that you can raise laptops to a comfortable standing height for most people. Moving from sitting-to-standing is fast, convenient and effortless thanks to the spring-assisted lifting mechanism. SIMPLE STAND UP DESK CONVERSION for DESKTOP COMPUTERS: You've found the ideal adjustable-height riser for your desktop computer! There's plenty of room on the 27.5x19.5” top panel to hold your monitor + keyboard + mouse + work essentials. The single point of adjustment lets your quickly raise and lower your computer to the perfect height for you! HOW TO ADJUST CHANGEdesk MINI? 4. Enjoy the freedom to move throughout your day! CHANGEdesk Mini is an affordable, effective standing desk conversion. It lets you quickly move from sitting to standing throughout the day. Works as both a laptop standing desk converter and a desktop pc standing riser. FAST ADJUSTABLE HEIGHT STAND UP DESK CONVERSION: Spring-assisted height adjustment with a single lever makes moving between sitting & standing easy. Works great as an ergonomic laptop standing desk. PATENTED, ORIGINAL DESIGN: designed in-house to be an affordable, stable, portable, simple sit to stand conversion. 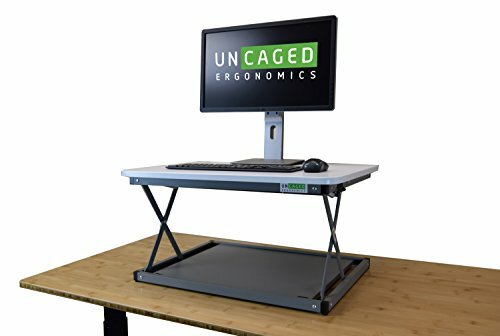 Exclusively manufactured by Uncaged Ergonomics. Beware of imitators and knock-offs!